Exactly fifty years ago a crucial episode took place in the history of "U.S. democracy"; an epic struggle whose outcome would influence the future of the entire world. Laurent Guyénot revisits those events and recalls what was at stake at that critical historical juncture. In May 1963, the U.S. Senate Committee on Foreign Relations opened an investigation into the covert activities of foreign agents on U.S. soil, focusing in particular on the American Zionist Council and the Jewish Agency for Israel. 1 The investigation was prompted by a report from the Chairman of that standing Committee, Senator J. William Fulbright, written in March 1961 (declassified in 2010), stating: "In recent years there has been an increasing number of incidents involving attempts by foreign governments, or their agents, to influence the conduct of American foreign policy by techniques outside normal diplomatic channels." By covert activities, including "within the United States and elsewhere," Fulbright was referring to the 1953 "Lavon Affair" 2 , where a group of Egyptian Jews was recruited by Israel to carry out bomb attacks against British targets, which were to be blamed on the Muslim Brotherhood so as to discredit Nasser in the eyes of the British and Americans. The Senate investigation brought to light a money laundering racket through which the Jewish Agency (indivisible from the State of Israel and a precursor to the Israeli Government) was channeling tens of millions of dollars to the American Zionist Council, the main Israeli lobby in the United States. Following this investigation, the Department of Justice, under the authority of Attorney General Robert Kennedy, ordered the American Zionist Council to register as "agents of a foreign government," subject to the requirements of the Foreign Agents Registration Act of 1938, involving the close monitoring of its activities. In 1960, John Kennedy himself received a financial aid offer from the Israeli lobby for his presidential campaign. He decoded Abraham Feinberg's proposal for his journalist friend Charles Bartlett in the following terms: "We know your campaign is in trouble. We're willing to pay your bills if you'll let us have control of your Middle East policy." Bartlett recalls Kennedy's promise that "if he ever did get to be President, he was going to do something about it 4 Between 1962 and 1963, he submitted seven campaign finance reform bills but all were defeated by the influential groups they sought to restrain. All government efforts to stymie the corruption of American democracy by Israeli agents were stopped short by Kennedy's assassination and his brother's replacement at the Department of Justice by Nicholas Katzenbach. The American Zionist Council evaded foreign agent status by dissolving and renaming itself American Israel Public Affairs Committee (AIPAC). Ten years later (April 15, 1973), Fulbright commented on CBS: "Israel controls the U.S. Senate. [...] The great majority of the Senate of the U.S. -- somewhere around 80 percent -- are completely in support of Israel; anything Israel wants Israel gets." AIPAC continued the same practices, dodging any sanction even when its members were caught red-handed in acts of espionage and high treason. In 2005, two AIPAC officials, Steven Rosen and Keith Weissman, were acquitted after having received from a member of the Pentagon Office of Special Plans, Larry Franklin, documents classified as Secret-Defense which they transmitted to a senior Israeli official. In 2007, John Mearsheimer and Stephen Walt demonstrated in their book The Israel Lobby and U.S. Foreign Policy that AIPAC and less prominent pro-Israel lobbies were the main cause of the war in Iraq and, more broadly, the determining factor in the foreign policy of the U.S. in the Middle East. Considering that nothing has changed, there is no reason to believe that the government of Benjamin Netanyahu will not also obtain from the United States the destruction of Iran that it consistently clamors for. On October 3, 2001, Prime Minister Ariel Sharon was reported by Kol Yisrael radio to have said to his Foreign Minister Shimon Peres that "We, the Jewish people control America, and the Americans know it." 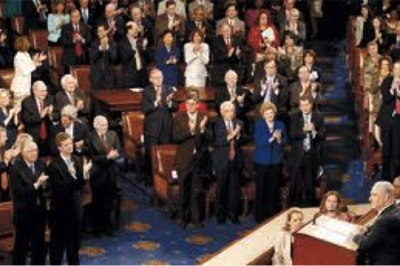 His successor Benjamin Netanyahu gave a demonstration of that on May 24, 2011, before the U.S. Congress, when members of both houses stood up to cheer him 29 times, in particular after each of the following remarks: "In Judea and Samaria, the Jewish people are not foreign occupiers"; "No distortion of history could deny the 4000- year-old bond between the Jewish people and the Jewish land"; "Israel will not return to the indefensible boundaries of 1967"; "Jerusalem must never again be divided. Jerusalem must remain the united capital of Israel." Had Kennedy lived, Israel's influence would most certainly have been curbed on yet another front, that of nuclear weapons. By the early 1950s, David Ben Gurion, who combined the functions of prime minister and defense minister, had engaged his country in the secret manufacturing of nuclear weapons, diverting the Atoms for Peace cooperation program, naively launched by Eisenhower, from its intended goals. Briefed by the CIA about the real purpose of the Dimona facility as soon as he moved into the White House, Kennedy put heavy pressure on the Israelis not to pursue it. He demanded that Ben Gurion open up Dimona for regular inspections, at first in person in New York in 1961, then through formal and increasingly insistent letters. In the last one, dated June 15, 1963, Kennedy urged that a first visit should take place immediately, followed by regular visits every six months, otherwise "This Government's commitment to and support of Israel could be seriously jeopardized 5." The reaction to this message was astonishing: Ben Gurion resigned on June 16, thus avoiding receipt of the letter. As soon as the new Prime Minister Levi Eshkol took office, Kennedy sent him a similar letter, dated July 5, 1963. Kennedy's intention was not to deprive Israel of a power which was reserved to the United States and its NATO allies. The President's approach was part of a much more ambitious project, which he had announced on September 25, 1961, nine months after taking office, before the General Assembly of the United Nations: "Today, every inhabitant of this planet must contemplate the day when this planet may no longer be inhabitable. Every man, woman and child lives under a nuclear sword of Damocles, hanging by the slenderest of threads, capable of being cut at any moment by accident or miscalculation or by madness. The weapons of war must be abolished before they abolish us. [...] It is therefore our intention to challenge the Soviet Union, not to an arms race, but to a peace race - to advance together step by step, stage by stage, until general and complete disarmament has been achieved 6." The message was well received by Nikita Khrushchev, who responded favorably in a 26-page confidential letter dated September 29, 1961, delivered through secret channels. After the October 1962 Cuban missile crisis, the nuclear war that was narrowly avoided thanks to their composure brought the two heads of State even closer to the awareness of their shared responsibility to liberate humanity from the nuclear threat. Khrushchev sent Kennedy a second private letter in which he expressed the hope that at the end of Kennedy's eight years of presidency, "we could create good conditions for peaceful coexistence on earth and this would be highly appreciated by the peoples of our country as well as by all other peoples 7." Despite other crises, Kennedy and Khrushchev continued this secret correspondence, now declassified, comprising a total of 21 letters in which the intention to abolish nuclear weapons was a prominent concern. In 1963, negotiations led to the first limited test ban treaty prohibiting nuclear weapon tests in the atmosphere, outer space and underwater, which was signed on August 5, 1963, by the Soviet Union, the United States and the United Kingdom. Six weeks later, on September 20, 1963, Kennedy manifested his pride and hope before the United Nations: "Two years ago I told this body that the United States had proposed and was willing to sign a limited test ban treaty. Today that treaty has been signed. It will not put an end to war. It will not remove basic conflicts. It will not secure freedom for all. But it can be a lever, and Archimedes, in explaining the principles of the lever, was said to have declared to his friends: 'Give me a place where I can stand and I shall move the world.' My fellow inhabitants of this planet, let us take our stand here in this Assembly of nations. And let us see if, in our own time, we can move the world to a just and lasting peace 8." In his last letter to Kennedy, handed to U.S. Ambassador Roy Kohler but which was never forwarded to the addressee, Khrushchev also took pride in this first historic treaty that "has injected a fresh spirit into the international atmosphere." 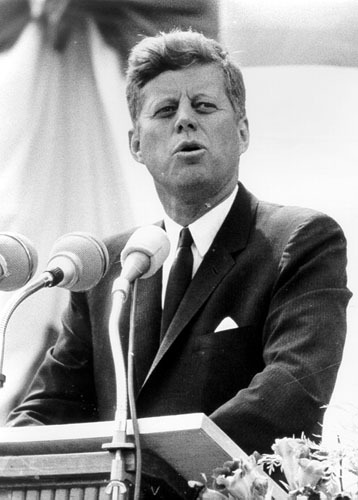 He formulated other proposals, borrowing Kennedy's words: "Their implementation would clear the road to general and complete disarmament and, consequently, to the delivering of the peoples from the threat of war 9." For Kennedy, the nuclear weapon was the negation of all historical efforts to civilize war by sparing civilians. He said to his friend and assistant Kenneth O'Donnell during his campaign for the Test Ban Treaty, "I keep thinking of the children, not my kids or yours, but the children all over the world." In his televised speech on July 26, 1963, he reiterated: "This treaty is for all of us. It is particularly for our children and our grandchildren, and they have no lobby here in Washington 10." In the sixties, nuclear disarmament was a realistic goal. Only four countries had a nuclear weapon. 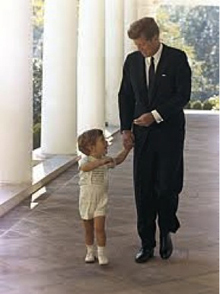 There was a historic opportunity to be seized, and Kennedy was determined not to pass it up. "I am haunted by the feeling that by 1970, unless we are successful, there may be ten nuclear powers instead of four, and by 1975, fifteen or twenty 11," he uttered prophetically during his press conference of March 21, 1963. While all NATO member states and countries of the communist bloc were following the example of the USA and the USSR and taking a first step towards nuclear disarmament, Israel was acting secretly on its own, and Kennedy was determined to prevent it. Kennedy's death a few months later eased the pressure on Israel. Johnson chose to turn a blind eye on the activities at Dimona. John McCone, the CIA director appointed by Kennedy, resigned in 1965, complaining of Johnson's lack of interest in the subject. Israel acquired its first bomb around 1967, without ever admitting it. 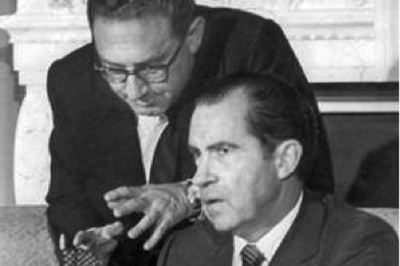 Nixon was just as unconcerned as Johnson, while his National Security Adviser Henry Kissinger privately expressed his satisfaction at the idea of having friendly Israel as a nuclear ally. Nixon, who ushered the "deep state" into the White House so to speak, played a double game: at the same time as he publicly supported the 1968 Non-Proliferation Treaty (which was not a U.S. initiative), he sent a contradictory top-secret National Security Decision Memorandum (NSDM-6) saying: "There should be no efforts by the United States government to pressure other nations [...] to follow suit. The government, in its public posture, should reflect a tone of optimism that other countries will sign or ratify, while clearly disassociating from any plan to bring pressure on these countries to sign or ratify 12." According to 2011 figures from SIPRI (Stockholm International Peace Research Institute), there are today across the world about 20,000 nuclear bombs with an average power 30 times that of Hiroshima, which equals 600,000 times Hiroshima. Of these, 1,800 nuclear warheads are on alert, i.e. ready to be launched in only a few minutes. With less than 8 million people, Israel is the world's sixth nuclear power. "If the President had his way, there would be a nuclear war each week 13," Kissinger was reported to have said. In the 1950s, Nixon had recommended to Eisenhower the use of the atomic bomb in Indochina and Korea. It was not until 1986, with the publication in the Sunday Times of photographs taken by Israeli technician Mordechai Vanunu inside Dimona, that the world discovered that Israel had secretly developed the atomic bomb. 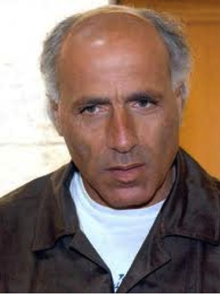 After being kidnapped by the Israeli secret services, Vanunu was convicted of the charge of "betraying state secrets." He spent 18 years in prison, including 11 in complete isolation. Since his release in 2004, he is prohibited from leaving Israel and communicating with foreign countries. Kennedy would not be remembered in Tel Aviv as a friend of Israel. In addition to his attacks against the outrageous lobbying activities of Israel and its nuclear power ambitions, Kennedy defended the right of return of the 800,000 Palestinian refugees expelled from their neighborhoods and villages in 1947-48. On November 20, 1963, his delegation to the United Nations called for the implementation of Resolution 194 crafted for this purpose. Kennedy probably never got the chance to read Israel's hysterical reactions in the newspapers: two days later, he was dead. Johnson's rise to power was greeted with relief in Israel: "There is no doubt that, with the accession of Lyndon Johnson, we shall have more opportunity to approach the President directly if we should feel that U.S. policy militates against our vital interests," considered Israeli newspaper Yedio Ahoronot. Far from reproaching Israel for its ethnic cleansing, Johnson fully embraced the myth of "a land without people for a people without a land", even going so far as to compare in front of a Jewish audience, "Jewish pioneers building a house the desert" with his own ancestors colonizing the New World - which, in fact, unintentionally underscored the equivalence between Israel's denial of its ethnic cleansing of Palestine, and the denial by the Americans of their own genocide history. While Kennedy had cut down aid to Israel, Johnson increased it from 40 million to 71 million and to 130 million the following year. While the Kennedy administration had authorized the sale of a limited number of defensive missile batteries to Israel, under Johnson more than 70% of the aid was earmarked for military equipment, including 250 tanks and 48 Sykhawk offensive aircraft. Military aid to Israel reached 92 million in 1966, more than the total of all previous years combined. Conversely, by denying them U.S. aid, Johnson forced Egypt and Algeria to turn to the Soviet Union to maintain and upgrade their defense systems. 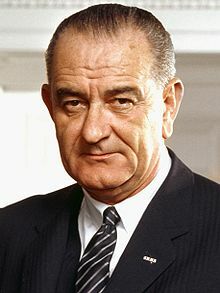 In June 1967, Johnson gave Israel a "yellow light" for its so-called "preventive" war against Egypt, by a letter dated 3 June, when he assured Israeli Prime Minister Levi Eshkol of his determination to "protect the territorial integrity of Israel [...] and provide as effective American support as possible to preserve the peace and freedom of your nation and the area." Kennedy's death deeply affected the Arab world, where his portrait graced many homes. "Now, De Gaulle is the only Western head of state on whose friendship the Arabs can rely," said Gamal Abdul Nasser. While reducing aid to Israel, Kennedy had generously provided grain to Egypt as part of the Food for Peace program. For that country, the short-lived presidency of John F. Kennedy will have been an enchanted interlude, a dream shattered all too soon. In 1954, under Eisenhower, Egypt had been the target of false flag terrorist acts perpetrated by Israel in order to "break the West's confidence in the existing Egyptian regime [and] to prevent economic and military aim from the West to Egypt 14," according to the very words of the head of military Intelligence (Aman) Benjamin Givli in a secret, today declassified, telegram. The accidental ignition of an explosive device led to the exposure of the conspiracy, sparking the scandal which became known as the "Lavon Affair" after defense minister Pinhas Lavon, a scandal which was quickly stifled by Israel and the United States. Prime Minister Moshe Sharett, who advocated a moderate brand of Zionism, respectful of international rules, acknowledged at that time (but only in private) the irresistible rise of extremists, among which he included future President Shimon Peres, who "wants to frighten the West into supporting Israel's aims"and that "raises terrorism to the level of a sacred principle 15." Kennedy's death gave free rein to this Machiavellian terrorism which Israel has developed into an art form. Two days before the end of the Six Day War, the Israeli army launched against the USS Liberty the most famous and disastrous of its false flag attacks. On the sunny day of June 8, 1967, three unmarked Mirage bombers and three torpedo boats flying an Israeli flag bombed, strafed and torpedoed for 75 minutes this NSA (National Security Agency) ship -unarmed, floating in international waters and easily recognizable - with the obvious intention of leaving no survivors, machine-gunning even the lifeboats. They only stopped at the approach of a Soviet ship, after killing 34 crew members, mostly engineers, technicians and translators. It is assumed that if they had succeeded in sinking the ship without witnesses, the Israelis would have attributed the crime to Egypt, so as to drag the United States into war on the side of Israel. According to Peter Hounam, author of Operation Cyanide: Why the Bombing of the USS Liberty Nearly Caused World War III (2003), the attack on the Liberty was secretly authorized by the White House as part of the project labeled Frontlet 615, "a secret political arrangement in 1966 by which Israel and the U.S. had vowed to destroy (Egypt's Gamal Abdel Nasser)." The orders issued by the White House that day, which delayed the rescue mission by several hours, suggest that Johnson not only covered up the Israelis post-facto, but also conspired with them. Oliver Kirby, the NSA Director for Operations at the time, reported to journalist John Crewdson of the Chicago Tribune (October 2, 2007) that the communications transcripts from the Israeli planes intercepted by the NSA and sent to Washington immediately, left no doubt as to the identity of the attackers, and about the fact that they were aware it was a U.S. target before the attack: "I'm willing to swear on a stack of Bibles that we knew they knew [that it was a U.S. ship]." Unmasked, Israel claimed it was a case of mistaken identity and offered its apology, which Lyndon Johnson meekly accepted on the grounds that "I will not embarrass our ally." When, in January 1968, Johnson received Israeli Prime Minister Levi Eshkol to Washington and then invited him to his Texas ranch, relations were cozy. Israel will have drawn a lesson of impunity whose influence on its future behavior should not be underestimated: the price for failure in a false-flag operation against the United States is zero. In fact, failure is impossible, since the Americans will themselves step in to cover up Israel's crimes. Better yet, Johnson rewarded Israel by lifting any restriction on military equipment: weapons and U.S. aircraft immediately flocked to Tel Aviv, soon turning Israel into the top customer of the U.S. military industry. 1. ↑ The Senate Foreign Relations Committee Investigates the Israel. 2. ↑ Declassified Preliminary Report: Senate Investigates Foreign Agents -- 1961 -- 1963. 3. ↑ Quoted by Gore Vidal in his foreword to Israel Shahak's book Jewish History, Jewish Religion, 1994. 4. ↑ Quoted by Seymour M. Hersh in The Samson Option. 5. ↑ Quoted by Seymour M. Hersh, op.cit. 6. ↑ Quoted by James Douglass in JFK and the Unspeakable. 7. ↑ Quoted by James Douglass, op.cit. 8. ↑ Quoted by James Douglass, op.cit. 9. ↑ Quoted by James Douglass, op.cit. 10. ↑ Quoted by James Douglass, op.cit. 11. ↑ Quoted by James Douglass, op.cit. 12. ↑ Quoted by James Douglass, op.cit. 13. ↑ Quoted by Anthony Summers in The Arrogance of Power. 14. ↑ Quoted by Livia Rokach, Israel's Sacred Terrorism, 1980. 15. ↑ Quoted by Livia Rokach, op.cit. 17. ↑ Another precedent was President Johnson's war against the people of Vietnam, in which Australia participated. The false flag pretext, used to justify the escalation of the war and the aerial bombardment of Vietnam in 1964, was the fraudulent claim that the Destroyer USS Maddox had been attacked by Vietnamese warships off the coast of Vietnam in the Gulf of Tonkin. The following was also posted to johnquiggin.com .